Hellotxt is a simple and fun dashboard for the real-time web on Android. Love social media but not the information overload? Then download Hellotxt to organise your busy, social media world! Read all of your friends status updates on one manageable feed and send status updates to all of your nominated networks in a matter of seconds. 1). View all your social network updates in one easy-to-use feed, you can also add your favourite RSS feeds. 2). Update your social networks at the same time – pick from a wide selection, you can even schedule updates to go at a time that suits you. 3). Geo location – add this feature to your updates plus you can show what’s nearby on your map. 4). Make your posts fun! Doodle your friend’s pics, shake the app to pick a funny phrase or draw freehand on your maps. 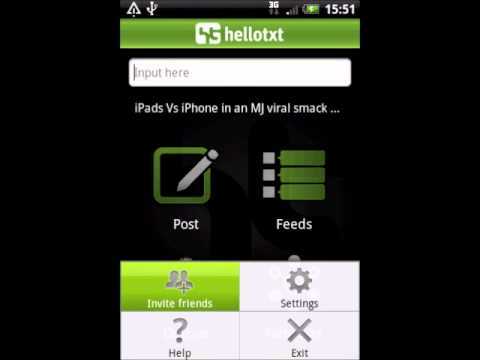 * Social networks included within Hellotxt include: Twitter, Facebook, MySpace, LinkedIn, WordPress, Google Buzz, Flickr, Bebo, Delicious, Friendster, Plurk, Tumblr and Orkut. Hellotxt is a web service available also on Iphone, Ipad and Android (â€œHellotxtâ€, â€œweâ€ or the â€œServiceâ€) operated by Buongiorno s.p.a. which owns and runs various Websites, including but not limited to Hellotxt.com, and any part of them, (the â€œWebsitesâ€). Hellotxt enables users in the communication and digestion of all their social information. Hellotxt makes easy to access and manage text and/or media to separate accounts on multiple social networks, publishing platforms, and micro-communication services from the web, mobile or by 3rd parties. Hellotxt works with the world's most popular social networking and web 2.0 sites. i. contains software viruses or any other computer code, files or programs designed to destroy, interrupt or otherwise limit the functionality of any computer software, computer hardware or other equipment. All messages, information, digital files or other materials, whether publicly posted, displayed or performed on, or privately transmitted, are the sole responsibility of the person who sends or publishes such items. Accordingly, you are responsible for all items that you upload, post, cause a display or performance of, email, transmit or otherwise make available via the Websites. Hellotxt reserves the right to, but has no obligation to, monitor or screen the content posted and/or displayed or performed in the Websites and to remove any content in its sole discretion. Nevertheless, YOU REMAIN SOLELY RESPONSIBLE FOR THE CONTENT OF THE MATERIALS YOU POST, CAUSE TO BE DISPLAYED OR PERFORMED IN ANY AREAS OF THE WEBSITES AND THAT YOU TRANSMIT IN ANY OF YOUR COMMUNICATIONS THAT USE THE WEBSITES AND THE SERVICES PROVIDED THEREBY. f. transmit any virus, worm, defect, Trojan horse or similar destructive or harmful item. f. create user accounts using any automated means or under false pretenses. Your use of the Service is at your sole risk. The service is provided on an â€œas isâ€ and â€œas availableâ€ basis. You understand that Hellotxt uses third party vendors and hosting partners to provide the necessary hardware, software, networking, storage, and related technology required to run the Service. You agree not to reproduce, duplicate, copy, sell, resell or exploit any portion of the Service, use of the Service, or access to the Service without the express written permission by Hellotxt. We may, but have no obligation to, remove Content and Accounts containing Content that we determine in our sole discretion are unlawful, offensive, threatening, libelous, defamatory, pornographic, obscene or otherwise objectionable or violates any partyâ€™s intellectual property or these Terms of Service. You must not upload, post, host, or transmit unsolicited email, or â€œspamâ€ messages. If your bandwidth usage significantly exceeds the average bandwidth usage (as determined solely by Hellotxt) of other Hellotxt customers, we reserve the right to immediately disable your account or throttle your file hosting until you can reduce your bandwidth consumption. Hellotxt does not warrant that the service will meet your specific requirements, the service will be uninterrupted, timely, secure, or error-free, the results that may be obtained from the use of the service will be accurate or reliable, the quality of any products, services, information, or other material purchased or obtained by you through the service will meet your expectations, and any errors in the Service will be corrected. You expressly understand and agree that Hellotxt shall not be liable for any direct, indirect, incidental, special, consequential or exemplary damages, including but not limited to, damages for loss of profits, goodwill, use, data or other intangible losses (even if Hellotxt has been advised of the possibility of such damages), resulting from: the use or the inability to use the service; the cost of procurement of substitute goods and services resulting from any goods, data, information or services purchased or obtained or messages received or transactions entered into through or from the service; unauthorized access to or alteration of your transmissions or data; statements or conduct of any third party on the service; or any other matter relating to the service. The failure of Hellotxt to exercise or enforce any right or provision of the Terms of Service shall not constitute a waiver of such right or provision. The Terms of Service constitutes the entire agreement between you and Hellotxt and govern your use of the Service, superceding any prior agreements between you and Hellotxt (including, but not limited to, any prior versions of the Terms of Service). To the extent that you use or connect to any third party messaging and/or content delivery systems through the Websites, you agree that you will comply with all terms and conditions of use for such third party systems, including without limitation, the proper registration for, acquisition and use of a user name and password for such system. You understand that the Websites and services offered thereby are offered to the public free of charge. If you use the Websites to advertise products or services in any way other than pursuant to a Advertising Agreement executed by you and Hellotxt (â€œUnauthorized Advertisingâ€), Hellotxt reserves the right to restrict your access to the Websites and to contact you about such Unauthorized Advertising. If you are so contacted and wish to continue using the Websites for commercial use, you may request, or Hellotxt may request that you work with Hellotxt, subject to Hellotxtâ€™s approval, to execute an Advertising Agreement defining the terms and conditions under which you may advertise on the Websites. You understand that the Websites act only as a forum and technical interface between users and that Hellotxt does not itself verify the qualifications of users, nor does it evaluate or control in any ongoing manner exchanges between users. Any opinions or statements expressed by a user are of those of the user alone, and are not to be attributed to Hellotxt. Hellotxt cannot and does not assume responsibility for the accuracy, completeness, safety, reliability, timeliness, innocuousness, legality or applicability of anything said, written, posted, displayed or otherwise made available by any user. You understand that you may be exposed to content that you find offensive to you, and that you use the Websites at your own risk. By posting information or content to, or otherwise causing content to be displayed on, the Websites, you automatically grant, and you represent and warrant that you have the right to grant, to Hellotxt an irrevocable, perpetual, non-exclusive, fully-paid, worldwide license to use, copy, publicly perform, publicly display and distribute such information and content and to prepare derivative works of, or incorporate into other works, such information and content, and to grant and authorize sub-licenses of the foregoing. No information or content of any kind that you submit to Hellotxt, upload, post, cause to be displayed or performed, transmit or otherwise make available using the Websites shall be deemed confidential or secret information. All other trademarks, trade names, service marks, service names are the property of their respective holders. In addition to any other use restrictions set forth in this Agreement, you may not engage in or facilitate the posting, modification, distribution, reproduction of any copyrighted material, trademarks, or other proprietary information belonging to others without obtaining the prior written consent of the owner of such proprietary rights. It is the policy of Hellotxt to terminate all privileges of any user who repeatedly infringes the copyright rights of others upon receipt of prompt notification. By email: product.hellotxt@buongiorno.com (Attn: Copyright Agent). The Websites may contain links to third-party sites that are not under the control of Hellotxt, and Hellotxt is not responsible for, nor does it guarantee the accuracy or integrity of, the content(s) of any linked site or any link contained in a linked site, or any changes or updates to such sites. The inclusion of any link does not imply that Hellotxt endorses or accepts any responsibility for the content on such third-party site. Your correspondence or business dealings with, or participation in promotions of, any third party website found on or through the Websites, including payment and delivery of related goods or services, and any other terms, conditions, warranties or representations associated with such dealings, are solely between you and such third party. Hellotxt is not responsible or liable for any loss or damage of any kind incurred as the result of any such dealings or as the result of the presence of links to such third party websites on the Websites. In addition, links to advertising that has not been approved by Hellotxt may be embedded in third party content displayed on the Websites. Hellotxt is not responsible for any content, cookies, or other technology used in connection with such advertising. EXCEPT AS EXPRESSLY PROVIDED OTHERWISE, ALL INFORMATION AND SERVICES OFFERED ON THIS WEB SITE IS PROVIDED â€œAS-ISâ€ WITHOUT WARRANTY OF ANY KIND AND HELLOTXT HEREBY DISCLAIMS ALL WARRANTIES EITHER EXPRESSED OR IMPLIED, INCLUDING BUT NOT LIMITED TO, IMPLIED WARRANTIES OF MERCHANTABILITY OR FITNESS FOR A PARTICULAR PURPOSE. IN ADDITION, EXCEPT AS EXPRESSLY PROVIDED OTHERWISE, MEEBO DISCLAIMS ANY WARRANTIES OF NON-INFRINGEMENT, TITLE, OR QUIET ENJOYMENT. In no event shall Hellotxt be liable for any special, indirect or consequential damages, or any damages whatsoever resulting from loss of use, data or profits, whether in an action of contract, negligence or other tortious action, arising out of or in connection with the use of the Websites or information available from the Websites. Except as expressly provided otherwise, you assume all risks concerning the suitability and accuracy of the information within the Websites. The Websites may contain technical inaccuracies or typographical errors. Hellotxt assumes no responsibility for and disclaims all liability for any such inaccuracies, errors, or omissions on the Websites. Hellotxt may terminate or make changes to all or any portion of the Websites, product offerings, and any other information and materials on the Websites and may delete any content that has been submitted to the Websites at any time and without notice or liability. The agreement will be effective as of the date of your acceptance thereof by clicking on the accept button or similar buttons or links as may be designated by Hellotxt or the date of your first use and will remain effective until terminated by either Hellotxt or You. Hellotxt may terminate or suspend the Service at any time. The termination or suspension may be without cause and/or without notice. Upon Service termination, your right to use the Service stops right away. ONCE THE CHANNEL SERVICE IS CANCELLED OR SUSPENDED, ANY DATA YOU HAVE STORED ON THE SERVICE MAY NOT BE RETRIEVED LATER. Hellotxt may at any time close your account if: (a) you supply misleading information at the time of registration, (b) you do not follow the terms stated in this agreement, (c) the use of your account contravenes the law or the conditions in this agreement, (d) there is reasonable suspicion that a crime has been committed, or (e) if there is a suspicion that you used your account to spam. The TOS shall be governed by and interpreted in accordance with the laws of Italy. If you not acting as a consumer, Court having exclusive jurisdiction is the Court of Milan, Italy. The original English version of the TOS may have been translated into other languages. In the event of inconsistency or discrepancy between the English version and any other language version, the English language version shall prevail.